Today, Fishing for Life runs several fundraising events throughout the year. I help with the Holes for Heroes event on the first Saturday every February. 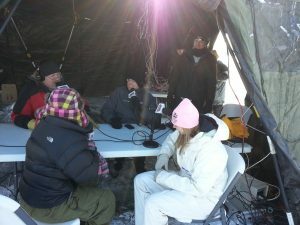 AM1280 (The Patriot) Radio interview, broadcasting live over the Internet from a frozen lake in Minnesota. My Fedora firewall and portable LAN equipment is on the table in the background. 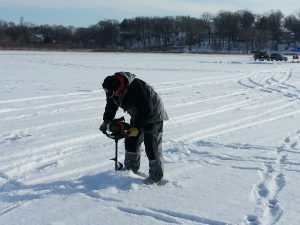 Holes 4 Heroes is a special Ice Fishing Contest designed to honor our military. Proceeds support the ministries of Fishing for Life. At Holes 4 Heroes, we work with all branches of the military to honor our troops. We set up a unique “Hole of Honor” where families of deployed soldiers can ice fish for free while being linked via video to their beloved soldier. We also stream event highlights over the Internet and facilitate the Saturday afternoon radio show from AM1280, The Patriot. Juggling all those Internet data streams on top of the ice requires lots of technology and coordination. That’s what I do. This is one of the coolest events in the United States. In more ways than one. Overheating equipment has never been a problem here. A special thanks to Nextera Telecom for bringing wireless Internet out onto the ice every year. And to Century Link for bringing 1 gb fiber to the top of White Bear Lake. Here is a page with a video and pictures from the 2014 event. Here is a piece from WCCO TV in Minneapolis from the 2013 event. Here is a WCCO TV piece from the 2012 event. If you want to help out with any Fishing for Life events or if you want to donate, just fill out the contact form in the sidebar and let me know. I’ll put you in touch with the right people.